Lots of great stuff is made in Pennsylvania – Martin guitars, UTZ pretzels, Tastykakes, Crayolas. But how about stuff about Pennsylvania such as books, clothing or maps? Turns out there’s a whole constellation of holiday gifts that celebrate the Keystone State. As its name implies, the aisles of the Pennsylvania General Store are a celebration of the Commonwealth. 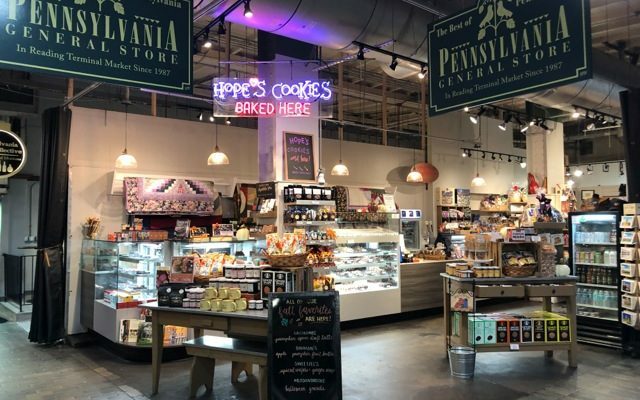 Beyond its vast selection of made-in-PA edibles (Goldenberg’s Peanut Chews, Asher’s chocolates, Wilbur Buds, artisan mustards, fruit butters and much more) this institution at Philadelphia’s Reading Terminal Market offers a bounty of cool stuff that invokes both its city and its state. 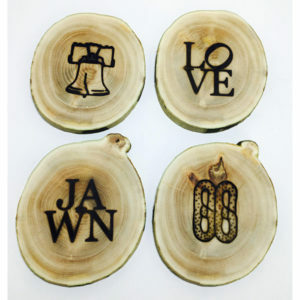 This is where to find ornaments by Philly artist Tony a Mason — sporting words like “jawn” and “youse,” they are the perfect gift for that Philly resident or expatriate on your list. You can also pick up a beautiful Pennsylvania Dutch hex sign or traditional potholders made in Lancaster County by a cooperative of Amish and Mennonite quilters. If you’re looking to wear your state pride on your sleeve, literally, check out Steel City. 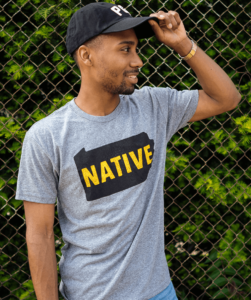 This bricks-and-mortar and online retailer offers merchandise that “captures the heart and essence of Pittsburgh,” according to its website. Looking for socks emblazoned with “yinz,” that distinctly Western Pennsylvania second-person plural pronoun? Or a t-shirt boasting the phrase “Explore PA”? (We like that one.) Or a “Little Pierogi” onesie for the baby that has everything? Steel City has it all. 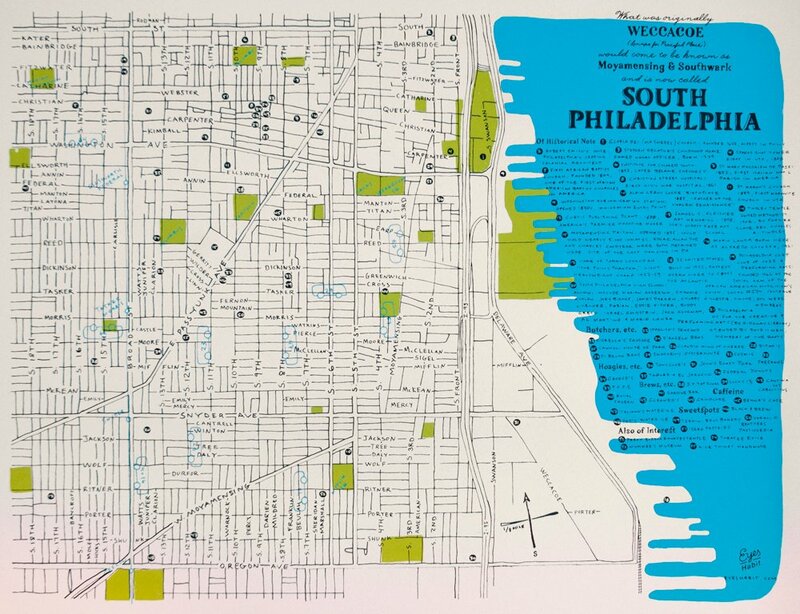 If you’re seeking something for the design-minded in your life, Philadelphia’s Eyes Habit offers handsome, hand-drawn and hand-screened maps of sections of the city and of the Delaware River. These gorgeous prints would be equally at home in a college dorm room or a sophisticated family home. A few other titles that might whet the appetites of Keystone State lovers on your list include PA-centric cookbooks like The Amish Community Cookbook by Carole Roth Giagnocavo and the Mennonite Central Committee, or the open source Project Gutenberg EBook of Pennsylvania Dutch Cooking. For those who relish the state’s great outdoors, there are hiking guides (John Young’s Hiking Pennsylvania) and birding guides (American Birding Association Field Guide to Birds of Pennsylvania by George L. Armistead and Brian E. Small). Sick of Goodnight Moon after 500 recitations? For little Pennsylvanians everywhere, there’s Good Night Pennsylvania (or Good Night Philadelphia or Good Night Pittsburgh), all part of the Good Night Our World series of board books. Future Nittany Lions or Lions’ offspring might enjoy Goodnight, Penn State by Laura H., Horst and Gloria Rosenberger. For older kids, try Benjy and the Belsnickel by Bonnie Swinehart, inspired by an old Pennsylvania folk tale.